Business phone sytems have evolved rapidly over the last few years and they rival elaborate PBX systems that previously could only be afforded by larger companies. Thanks to the availability of VoIP and hosted systems, as well as computer telephony integration (CTI), businesses of all sizes are now far more efficient and competitive than would have been possible without such systems. These VoIP phone systems ensure 24x7 availability of the messaging system, even if the business itself is not available 24x7. No message is ever lost, and advanced analysis of phone usage ensures that costs are minimized while efficiency is never sacrificed. Voip service providers offer a variety of bundles and packages. Yet the key to finding the right Voip solution is in the detailed analysis of your business needs and the corresponding phone system features. In reality, there are a few core features that will have most of the impact on your business. While examining your options for business VoiP, focusing on these core VoiP features can prevent you from being distracted by features that, while interesting or even promising, will not do the heavy lifting your business needs now. Virtual Phone Number: If a called number is busy, the call is automatically transferred to another extension. Permanent Call Forwarding: All calls attempting to connect to a specific number are automatically transferred to another extension (for example if a person is on leave). Screening Calls: Allows incoming calls to be handled differently based on their caller ID. This allows differentiated handling of calls. Some calls can be connected to cellphone while others could be diverted to voice mail or even be disconnected. Direct Inbound Dial (DID): An external caller can dial a DID number to connect directly to a recipient without having to go through an attendant. Do Not Disturb: Users can prevent incoming calls ringing on their extension by marking themselves as busy. Calls will be automatically diverted to voice mail or to another designated number. Extension Assignment: Each phone has an abbreviated extension number that can be used for internal calling, call transfer or dial in by extension numbers. Find Me/Follow Me: Users can designate several alternative phone numbers where he could be if he is not picking up his primary number. The system will ring each of these numbers sequentially before transferring the caller to voice mail. On-Phone Presence Monitoring: Internal users can monitor the on or off telephone state of other user’s lines. Shared Line Appearances: Allows a phone to be reachable by several numbers – i.e. calls to different numbers could land on the same phone. Time Dependent Call Handling: The system can handle incoming calls differently based on the time and/or day of the week. Users can configure choices for themselves. Calls after working hours could be transferred to cell phones etc. Call Park: An incoming call can be put on hold and the call can be retrieved by the user or another person even from a different phone. Hold: Pausing an ongoing telephonic conversation and retrieving it from the same phone. Call Pickup: A call ringing on another phone can be picked up by dialing a pickup service code and the extension number where the call is ringing. This can also be achieved by use of a soft key. Call Camp - On: Informs a user whose phone is busy that another person is trying to speak with her. On-Screen Pickup: A user can select any of the incoming calls using an on screen list. Ring (Hunt) Groups: An incoming call can be programmed to ring on several numbers (simultaneously or in series) till any one phone is picked up. Customizable Ring Tones: Change rings tones based on pre-decided parameters (in once case the company programmed the phones to ring differently for callers selecting Spanish or English from a menu). 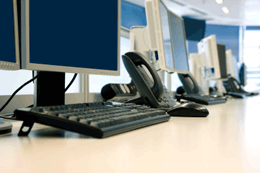 900/976 Blocking: The system blocks calls to premium rate telephone numbers. Auto Attendant: Allows callers to access a menu from which they can select the extension of their choice. Does not require an operator. Auto Directory/ Connect to Extensions: Gives callers an option to dial an extension number. Connect by Name: Option that allows incoming callers to connect to a user by dialing the first three letters of his or her name. Music / Messages On Hold: The system administrator can set music on hold from a selection provided by the phone vendor. Alternatively, any mp3 or a wma file can be uploaded. Many companies use this to play a promotional message while a caller is on hold. Legacy Equipment Support: The phone system connects callers to designated legacy extension numbers. This ensures that calls are not missed while the system is being upgraded. Automated Transfer: In case the called person does not pick up the extension, the call is automatically routed to a system that can send the call to another extension or to voice mail. Auto Ring Back: If an internal number you call is busy, you can dial a code and the system will call you back when the line is free. If the phone is picked up, the number that was initially called will be rung. A business phone system with the message on hold feature makes advertising easier for most companies today. The message on hold feature will play a recorded message with a voiceover and music for a caller to listen to while on hold. The message will typically discuss current sales offered by the company or an overview of the company. In the event of a power outage during regular working hours, it is imperative that the phone system does not shutdown. Most business phone systems on the market today offer a 60 minute back up power feature that keeps the phones running during an outage. The CTI feature is one of the most expensive features available on the market today because of the technology involved. This feature helps employees save time dialing, reduce wrong number dialing, and improve customer service. When the phone system is synched with the computer system and a client calls, the number will register on the computer, opening up the client’s account so the employee does not have to search for it while on the phone with the client. There are two types of paging features available on business phone systems today: the ability to page another employee over the company’s radio system and to call another employee on their office phone from an office phone in the building. The ability to forward phone calls to a cell phone, a home phone, or another work phone from a main office number is a feature that almost all businesses require when purchasing a new phone system. All the employee has to do is hit the forward button and then type in the number to forward to incoming phone calls to while out of the office. Voice mail is very important when purchasing a new business phone system because it allows clients and employees to leave messages at the office when the number being called is in use or no one is available to answer. Some systems include this in the basic system, while others may require a small upgrade. This feature allows the company to connect to employees at off-site locations simply by dialing an external number. All businesses these days need a feature that allows multiple employees to talk on the phone with clients and others in the office, which is where a trusty conferencing feature comes into play.